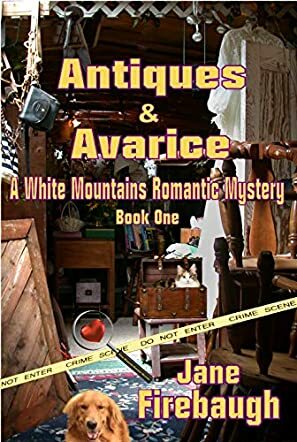 Antiques and Avarice is the first book in the White Mountains Romantic Mysteries series written by Jane Firebaugh. Olivia McKenna searches a second hand store, feeling blessed to be the only customer scouring the shelves for antiques which her customers have requested. At the cash register, Olivia is unable to get the cashier’s attention and quickly discovers the store owner, Lewis Ketterer, murdered in the back room. Olivia is listed as a suspect due to the fact that she’d been the one to call 911, was able to point out the murder weapon at the scene, and was in the store at the time of the murder. But the chief investigator, Josh Abrams, knows that something doesn’t fit and believes Olivia to be innocent, while wondering why she keeps obsessing over a cat. When he realizes the link between the cat and the dead body before him, his protective instincts kick in. Olivia finds herself thinking about Josh as more than a detective, not realizing that the attraction is mutual. When Olivia becomes the repeated target of a stranger, Josh breaks his own rules and gets personally involved, determined to do whatever it takes to keep Olivia safe at all costs. Jane Firebaugh pulls out all the stops to deliver the most explosively powerful romance novel I have read in a long time. Amidst all of the crime, suspense and drama, Olivia’s love of animals shines through, and when she sees how much of a soft spot Josh has for them too, the dam wall of their attraction shatters, allowing the romance to flow so beautifully. I enjoy stories that feature animals in such a positive atmosphere, and the lengths that a police officer will go to in order to protect the woman that he loves warmed my heart. Antiques and Avarice is a real winner in my book, and I recommend it to readers who enjoy a whole lot of animal antics, police drama, murder-mystery, and action entwined in an epic romance which sizzles with every turn of the page.